We are painting one 'Unique Butterfly' on Monday April 29th! Customize Your Painting; paint the puzzle piece, add a different design or paint it a solid color! Make it YOURS and make it FUN! Plan Your Mother's Day Weekend Now! Our Mother's Day weekend classes are now OPEN for RESERVATIONS! Sip N Paint! Don't wait until the last minute to book your seats to make lasting memories with your mom and the whole family! It's FUN ART, not fine art! We have family friendly classes for ages 7 and up where the whole family can paint together. You can also make it a date night with your special someone and leave the kids with a sitter. Better yet, get all of your mom friends together for a Moms Night Out! BYOB & snacks Paint Nite, Book NOW! Throw a Party in Cocoa Village! Take a break and spring into our Cocoa Village, Paining with a Twist Studio for a Sip and Paint experience you won't soon forget! We're getting a head start with all the FUN! Can't draw a stick figure? No problem. We love special snowflakes ;) Our artists will guide you step by step all while rocking out to music, games & don't forget the prizes! Our classes are for ages 7-107! Check out our Event Calendar and reserve your Paint Nite now! Paint Your Pet Portrait With Us! Want to paint a portrait of your furry friend? We have just the class for you on! This special class allows you to paint your pet in a 3-hour class. We even pre-sketch it for you and guide you along to make your custom painting, you just sit back and paint & sip. Hurry & sign up today for Saturdays classas, last day to sign up is Wednesday! We make having a party easy and fun! To reserve your Paint Nite sips and strokes date and time, just complete our online form or just call us at the studio and we'll help set it up! You'll get access to our extensive Art Library giving you over 7000 pieces of artwork to choose from. Choose a passcode so your friends can go online and register themselves. Bring in your favorite beverages (we have a full liquor license) and some snacks, a cake or whatever you wish and we do the rest. No clean up! Just walk out of the studio with your masterpiece and leave the mess behind! It doesn't get any easier than that! Call us TODAY and we'll get the pARTy started. 321-339-8851. 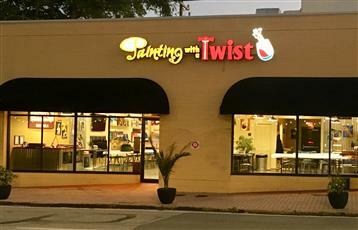 Fall in Love with Painting with a Twist! Let our local artists guide you step-by-step through one of our FUN paint parties! We provide all of the materials, including a canvas, brushes and our PWAT acrylic paint. Our studio is clean, open, and well lit for the best painting experience out there! Don't be intimidated by our amazing paintings, no experience is needed to complete your own masterpiece, we promise! Sign up for your favorite class, and come see why we're a little bit of paint, a little bit of wine, and a whole lot of fun®!